American Boat Listing ABLBoats ™ Used boats since 1983. Please contact owner Kevin Email: Kevin@yukontradingcompany.com - Phone: 206-484-9815. 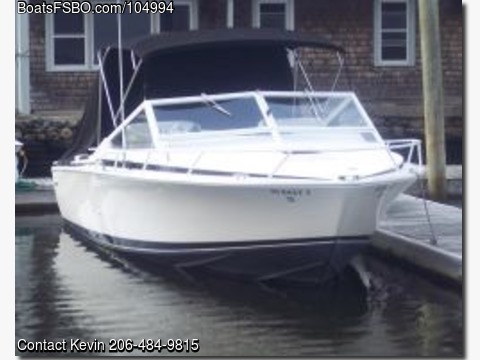 Salt Water Series II 350 cid/260HP Approx 1100 Hours. Tank: 240 Gallon Gasoline Tank. High Anxiety is an excellent example of a C Raymond Hund design Bertram 28 Moppie with a Deep-V Hull and European Styled Superstructure. Her Transom Platform was mechanically fastened to the hull and accessible, complete with a Stainless Steel, Drop-Down Swim Ladder and Upper Boarding Ladder to the Aft Cockpit. The Main Cabin has Screened Cabin Hatches and Opening Hatch above the Low-Profile Foredeck, Plush Upholstery, Lighting, a Lockable Door and Comfortable Seating on Padded Upholstery throughout the cockpit area. There is a Cuddy Cabin with a Rebuilt Head and Sink, along with Upholstered Sleeping Area. Has a Halon Automatic Fire Extinguisher System. Updates since I purchased it include New Stereo, 4 New Speakers, New Fire Extinguisher, New VHF Radio and Antenna (4'), Newer Hummingbird KDR 610 Depth Sounder, Garmin Fish Finder, New 6-Position A/C Panel with Main Breaker, New 13-position D/C Panel, installed Optima Maintenance-Free Batteries, 3 Battery Bank Distribution Panel, Auto Charging Relays, Battery Chargers, Bilge Pumps, New Twin Single Lever Controls. Rudder Tables were Rebuilt in 2007 and Reassembled with Metal Connection Points. Bench on Aft Deck was Completely Rebuilt in 2017. Closed Cell Foam/Faux Teak Flooring also installed. Custom Covers for Bow and Main Section. New Bimini in last 5 Years.